Boudewijn Zenden is a product from the PSV youth academy. After making his debut in Eindhoven in 1994, he was a regular player in the squad. In his final season, 1997-98, the winger played his most successful one that resulted in foreign interests. He moved to FC Barcelona and played there for three seasons. His Spanish spell was followed by a 12M€ move to the Premier League where he joined Chelsea. From 2003-05 he played for Middlesbrough followed by two seasons at Liverpool. His first season in Liverpool was dramatic. Zenden suffered a knee injury in the Champions League tie against Real Betis on 23 November 2005 and it was materialised that he has crucial ligament damage. The Dutchman went to the US to undergo surgery from renowned knee specialist Dr Richard Steadman. That was the end of the season 2005-06. Happily, the surgery was successful and he played several matches in the next season. In July 2007, the Merseyside club agreed a possible move from the player. PSV showed interest to sign their old player again, but Zenden decided that a move back home was too early in his career. Soon after the announcement of the club, the news came that Boudewijn Zenden has signed a 2-year contract at the French club Olympique de Marseille. Several clubs showed their interest to sign the Dutchman, but the French wife of Zenden was probably of big influence for his move to France. His contract expired in 2009. He was somewhat successful in France, but his contract was not extended. Zenden took a long time to find himself a new club. He expressed already that he was not ready for a return back home. 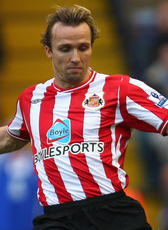 In October 2009, English club Sunderland and Zenden confirmed a deal until the end of the season. His successful first season stay at the Black Cats continued with an extended contract until June 2011. After leaving Sunderland he was looking for a new club. Several trials were done during the first half of the 2011-12 season. In November 2011 he impressed Scottish club Celtic Glasgow, but he was not given a contract. In November 2012, Zenden was appointed as assistant manager at Chelsea. Zenden joined his former club, now as coach. He is the assistant of Rafael Benitez until the end of the 2012-13 season after the dismissal of manager Roberto di Matteo. That also sealed his retirement as professional player. In June 2013 he has left Chelsea and returned home to work on his coaching certificates. He joined his former club PSV, to gain more coaching experience at the PSV Reserves.